Re: More fuel trouble need insight. Definitely take the filter apart and check the element for any debris. 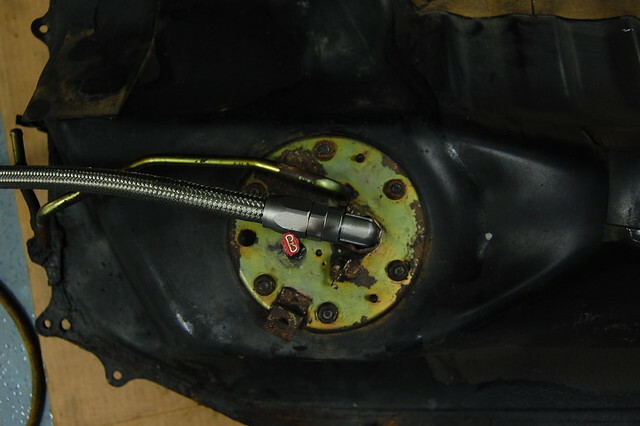 as for the injectors, injectors don't like to be stored with e85 for a long time. I've had a few guys up here in mn who have and their fic id injectors seize up due to not pickling or running the injectors in reg pump gas before storing their cars over the winter. did your car sit for a while (more than 1 month) without being started? if you have inline filter, chances are it's not clogged. Most it has sat for is maybe three weeks while I've been at work. Just doesn't make sense cause I beat on it and it runs fine then that last time at the track it f'd me. If it does it again imma toss the dual hanger just to 100/ eliminate that as a possibility. How are you all running your single pumps stock hanger with a fitting welded to the top? well if the injector isn't stuck, maybe the driver is just bad. have you tried turning down the boost and going WOT to see if injector/fuel is cutting off? with my walbro 400, i ran a crush washer + 1.25 metric to -6 straight + -6an 90degree fitting to -6an hose. Nothing complicated. You could also have a problem with your regulator.. it could have debris in it or the diaphragm could be torn, stuck, or damaged in some way. Check out while system today from what I can tell everything is good to go. Beat the hell out of it again today and nothing. Hopfully I will be running stronge on Friday at the track. Any chance could be ignition related? haha yea never thought of that, doh. son, you're doing it wrong. I never heard of a s300 that doesn't data log, so yea I can... I have it turned on to auto record my runs but I will run my laptop next track so I can have the complete iteration from pit to pit on the track. But like boost said I don't have a fuel preasure linked to it. Sensor cost I think 30 bucks. WTB: Full Blown dual pump hanger for eg/ek/dc ASAP!!! Quick Reply: More fuel trouble need insight.